When I first thought of doing a series on artists who worked in the medium of paper, I did not plan to focus on just those who created portraits or human scenes/clothing, but when I found I had more than enough artists for such a theme, I decided to go for it. Another series on paper art will come a bit later. I was first drawn to the idea of books as portraits when I saw the image at left, but when I tried to track down the artist, I found it was by Souverein, a Dutch post production company that specializes in high end image creation. It was one of many “Written Portraits” done as part of an advertising campaign, and lovely as it was, how much technology rather than artistry was involved was unclear, so I kept looking. 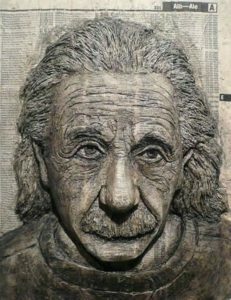 Next, I found Alex Queral, a Philadelphia-based artist who uses discarded phone books to carve the images of famous faces. He noted, “In carving and painting a head from a phone directory, I’m celebrating the individual lost in the anonymous list of thousands of names that describe the size of the community. 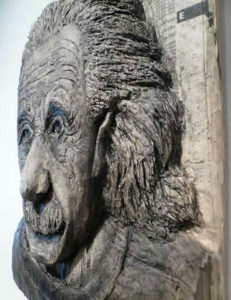 In addition, I like the idea of creating something that is normally discarded every year into an object of longevity.” He also likes the three-dimensional quality that makes the result a bas relief sculpture rather than a simple picture, as well as the unexpected results that sometimes occur with the fragility of carving pages. You can see more of his work on his website. And then I found mixed heritage Tlingit/Aleut artist Nicholas Galanin, who was born in Sitka, Alaska in 1979. His first artistic medium, practiced when he was still a young boy, was jewelry and light metals, and his first teacher was his father. He went on to receive a Bachelor of Fine Arts at London Guildhall University in England, where he learned silversmithing, and a Masters of Fine Arts in indigenous visual arts at Massey University in New Zealand. Today Nicholas Galanin has a career that ranges from conceptual art installations to musician to fashion to salmon fishing. As one article described him, “Galanin represents the hybridity that occurs living on the reservation in the digital age.” His What Have We Become? series offers the 3D book sculptures that first intrigued me. The same article notes that “His work often explores a dialogue of change and identity between Native and non-Native communities,” but he is not without a sense of humor, as his satirically titled exhibition I Loooove your Culture shows. These days, Mr. Galanin purposely mixes contemporary art with elements of his background. He “wants his work to link his heritage and contemporary culture, but does not want to impose any predetermined idea of what that means. ‘I don’t want to force them to sit together,’ he adds.” Mr. Galanin stresses that “you have to use your own unique perspective,” noting, “Culture cannot be contained as it unfolds.” He looks backwards, but also forward with an active curiosity that impacts every new thing he creates. Are you intrigued by books that reflect faces? Do you like the results? 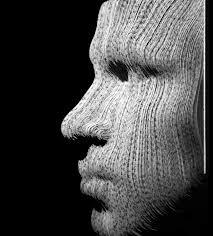 If a book were used to recreate your face, would you like a specific book to be used? If so, which one? And what age would you like to be portrayed as? Do you agree with Nicholas Galanin that culture is not static, but always unfolding? 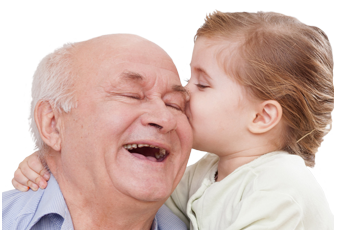 What’s worth preserving from your past? What needs to be discarded? 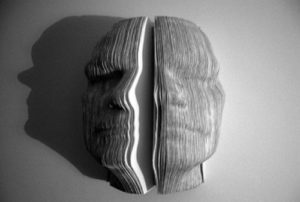 Posted in Improv Art and tagged Alex Queral, books as portraits, Improv Art, Improv artists, Nicholas Galanin, portraits from elephone books, quirky art, souverein.